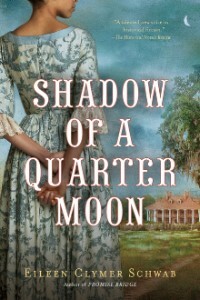 Eileen Schwab : Eileen Clymer Schwab, Author of PROMISE BRIDGE and SHADOW of a QUARTER MOON. "Jacy Lane, you are nothing more than a foolish quarter moon!" These words are the earliest recollection I have of my mother and me as she yanked my unruly hair in a fit of frustration, unable to wrestle my braids into perfection. More than twenty years later, as I wept in the glow of a full and brilliant July moon, I felt the sting of being dull and incomplete in her eyes. Much like the sliver of a quarter moon, I was a fragment of what she had hoped me to be. When the crunch of boots approached me from the rear, I shivered with dread and despair in the knowledge that I was a mere shard of the woman I dreamed of being as well. "Promise me," he said louder. He grabbed one of my hands and pressed it into his upright palm as we knelt facing each other. 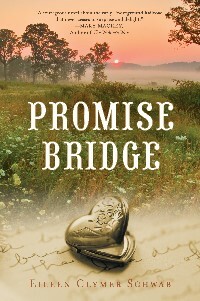 "This is a promise bridge," he said, squeezing my hands tightly to emphasize the connection. "And it bridges a promise flowing from your heart to mine. It can't never be broken. The promise is a part of you now, understand?" * See latest reviews on News/Event page. All content copyright © 2009-2017 ECSchwab.com. All rights reserved. Site by Glass Slipper WebDesign.